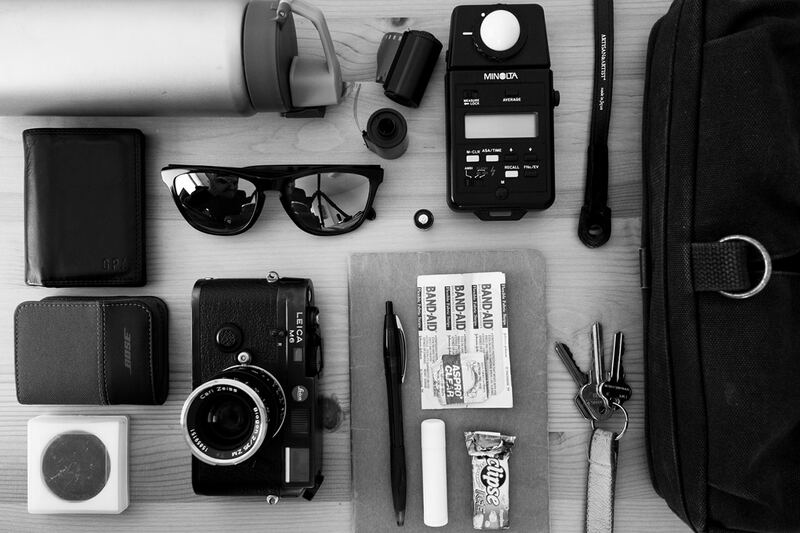 Hub packs analog gear when he wants to escape from the grind and is well prepared for any scenario. I’m Hub Pacheco, a commercial and portrait photographer based in Manila, Philippines. 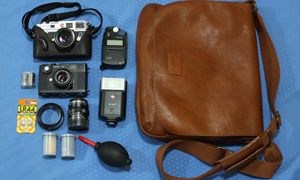 I recently came back from a five-week backpacking trip around Europe and here’s the bag that I had on me (apart from my top-loading main backpack of course). I’ve had my Thinktank Retrospective 10 since 2013 and it’s still holding up beautifully. I’ve recently reinvigorated my love for analog photography after years of shooting digital commercially. 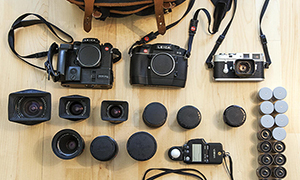 I managed to score a used Nikon F3 as my main camera with my 50mm 1.4 AiS which I only loaded with black and white film. As for color film, I had my Olympus XA. I’m a big fan of multiple formats so I also brought my Lomo Instant Wide which I used to shoot and send postcards to my friends back home. And as timing would have it since they just rebranded, my Polaroid SX-70 also tagged along. With all the film I have on me and the impending language barriers I was to face, I had the brilliant plan of putting all of the film inside my large Domke film guard so I wouldn’t have to explain myself at airport security checks. It turned out that I still had to explain myself to airport security because the bag was lead-lined and the x-ray couldn’t see through it. Bah. The film was safe though. The fifth and only digital camera I brought along (apart from my iPhone) was my trusty Fujifilm X20. 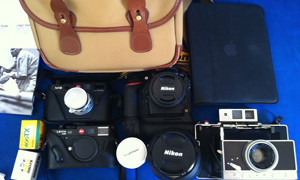 I seldom bring DSLRs when I travel because it feels like work if I have it on me, hence, the mostly analog setup. Rounding up the bag are other essentials: small notebook & pens, iPad mini for maps and entertainment, charging cable, power bank, an umbrella, and the ever-useful insulated tumbler. Photos from my trip are currently updating on my Instagram: www.instagram.com/hubitall and my commercial work is at www.hubpacheco.net. 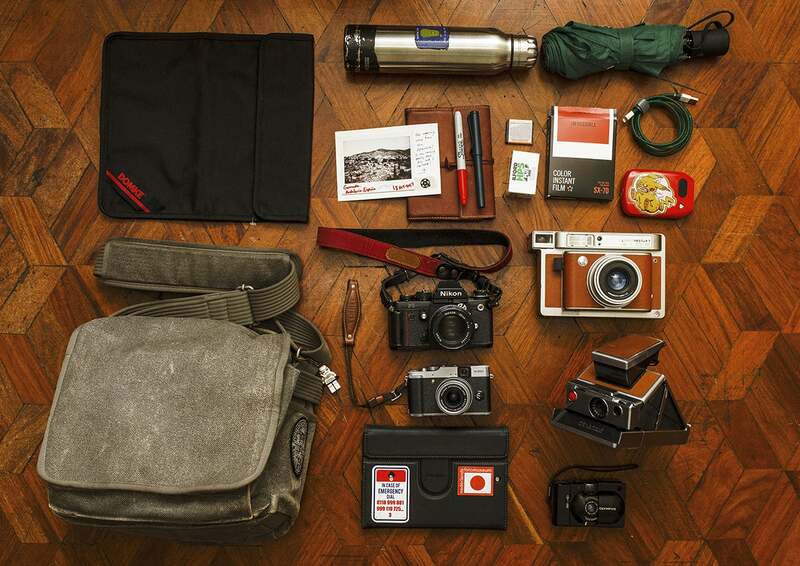 Thanks for sharing with us your bag shot Hub, sending instants as postcards is a nice touch. Your commercial work is beautiful and I’m loving your street photo’s! Going to follow you in Instagram now. Also, where can I get a “In case of emergency” Moss Sticker? Thanks, Shawn! The Moss sticker is fan-made from a local seller in Manila called Fandom Feels PH on Facebook.